LG To Bring Perfect Gaming Monitors For Intense Action To IFA Berlin – Aug 24, 2017– Seoul, Korea (Techreleased) – LG Electronics (LG) will introduce two new gaming monitors at IFA 2017 in Berlin next week to even better meet the needs of the burgeoning gamer consumer base and to deliver some of the smoothest gaming experiences possible today. LG’s newest 32- and 27-inch GK monitors not only offer action enthusiasts a visually stunning experience but deliver a winning edge in competitive gaming as well. LG’s GK gaming series implements the latest technological breakthroughs, namely high refresh rates of 144Hz (overclockable to 165Hz*) and 240Hz. 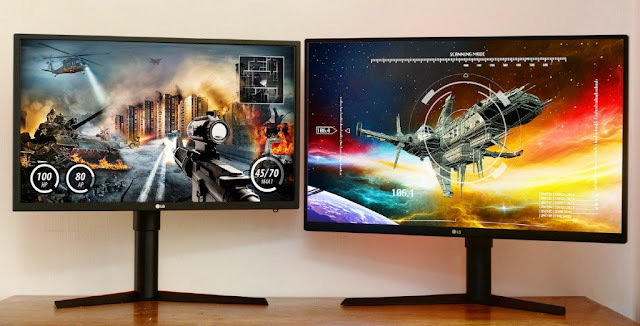 LG’s new 32-inch gaming monitor (model 32GK850G) is the ideal display for game enthusiasts who want seamless, quick motion gameplay on large screens with high picture quality. Featuring fast refresh rate, LG 32GK850G delivers incredibly fluid graphic motion while its NVIDIA G-SyncTM graphic processing technology – which is taking the gaming community by storm – all but eliminates stuttering and screen tearing when in the heat of the action. This monitor will handily process all game genres without any afterimages while delivering rapid and fluid motion at a maximum brightness of 350 nits on its QHD (2,560 x 1,440) screen. What’s more, the 32-inch monitor enhances the gaming experience in a distinct way with Sphere Lighting, which uses LEDs behind the monitor to create soft ambience lighting that increases the immersiveness of games and reduces eye fatigue while also adding a beautiful design element to the monitor. Unique features such as Black Stabilizer deliver clearer contrast to give gamers maximum visibility at all times while Dynamic Action Sync minimizes input lag so that players can react faster to the action. A friendly graphic user interface allows players to easily customize modes for different games and for maximum convenience, the monitor features a one-click stand which installs without the use of screws or tools and allows the monitor’s tilt, height, swivel and pivot angle to be adjusted with minimal effort. The 27-inch GK monitor (model 27GK750F) also delivers incredibly smooth gameplay with the highest refresh rate and the fastest response time. The more compact monitor is designed to take on all gaming needs with enhancements to improve the player’s chances of willing, such as 240Hz refresh rate, 1ms Motion Blur Reduction and AMD FreeSync™ technology. Features such as Black Stabilizer, Dynamic Action Sync and Crosshair – which places a target in the center of the monitor in order to enhance accuracy in FPS games – are designed to make the gaming experience second to none. At IFA 2017, LG will also showcase its stunning 34-inch UltraWide gaming monitor (model 34UC89G) with its expansive 21:9 aspect ratio display to maximize the gaming experience. The immersive effect is most evident in racing, RTS or AOS games which support 21:9 aspect ratio. This monitor also supports NVIDIA G-Sync and 144Hz refresh rate (overclockable to 166Hz* ) to maximize the experience for all gaming genres.